Palli Mongal Karmosuchi Job Circular 2017. PMK will recruit total 650 Posts circulated on 24 April 2017. PMK stands for Palli Mongal Karmosuchi (PMK). Palli Mongal Karmosuchi Job Circular 2017. Interested and eligible Bangladeshi Citizenship candidates are requested to apply after fulfilling the circularized conditions and instructions. Deadline for Submitting Application is (Please see the image Job Circular for details). 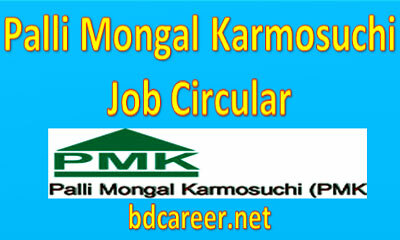 Palli Mongal Karmosuchi (PMK) is a Non-Profit, Non-Governmental Organization (NGO). PMK is a leading national level developmental organization located in headquartered at Zirabo, Ashulia, Dhaka. It was initiated by the voluntary efforts of a group of local men and women. It was registered formally in 1988 with the Directorate of Social Service and later in 1993 with NGO Affairs Bureau to receive foreign donations. Published Date: 24 April 2017. Application Deadline: (Please see the image Job Circular for details).